Nerello Mascalese with 20% other varieties, including Nerello Capuccio and possibly Alicante Bouschet and Grenache from vines in two co-planted parcels (Pietramarina and Crasa, totalling 1.5 ha) at 550 to 750 metres in elevation on the north-facing side of Mount Etna, hence the bottling’s name. The vines average 45 to 50 years old, with the oldest being about 80. The manually harvested grapes were transported to Arianna Occhipinti’s winery in Vittoria. Some clusters were destemmed, others left whole. Fermented with indigenous yeasts and macerated on the skins for 15 days in a cement tank with no temperature control. Matured 16 months in 750-litre Slavonian oak botti. Minimally sulphured. The 2015 is the second vintage of the wine. Total production: 6,000 bottles. 13.5% ABV per the label, 12% ABV per the SAQ. Quebec agent: oenopole. The blend is similar to the Versante Nord but with 90% Nerello Mascalese. 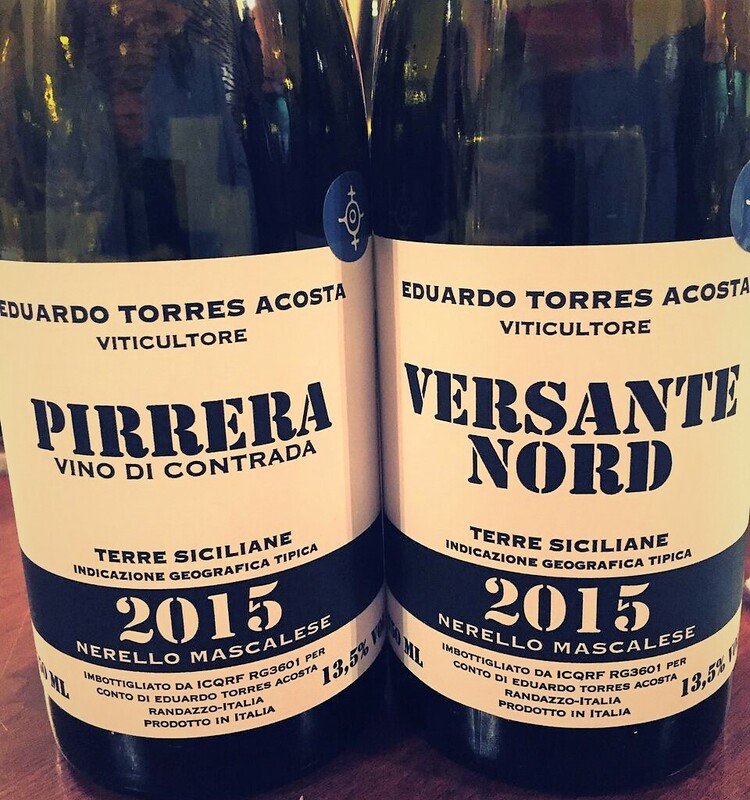 All grapes come from the high-altitude (850 metres) Pirrera vineyard on the north slope of Mount Etna, which had been abandoned until Acosta began rehabilitating it. The vines average 50 years old and the soil is sandy with volcanic ash and stones. The wine-making was identical to that for the Versante Nord. The 2015 is the second vintage of the wine. Total production: 1,100 bottles. 13.5% ABV per the label, 12% ABV per the SAQ. Quebec agent: oenopole. Soon after the wines’ release, a MWG member who was wondering which if any to buy asked a well-regarded SAQ wine advisor for input. The advisor said he was enamoured with the Versante Nord but felt the Pirrera wasn’t worth the extra outlay. The member bought some of the Versante and gave the Pirrera a pass. At the tasting a few days later, our experience was more the opposite: both wines were delightful but the Pirrera was the standout. The member made a beeline to the SAQ and scored a couple of bottles.